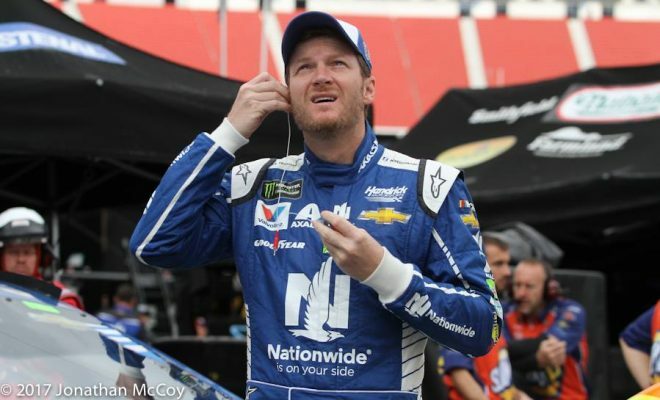 It was announced Tuesday morning by Hendrick Motorsports that Dale Earnhardt Jr., driver of the No. 88 Chevrolet, would retire following the 2017 season. Earnhardt, who turns 43 in October, returned to competition this season after being sidelined with a concussion for half of the 2016 season. While many were unsure if Earnhardt would return at all, he went through the rehabilitation process and was cleared to return to racing full-time. Earnhardt, who has been voted NASCAR’s Most Popular Driver 14 times, has 26 MENCS victories in 603 starts which began in 1999. Earnhardt who has won the Daytona 500 twice in his career in 2004 and 2014, and is a two-time champion in what is now known as the XFINITY Series, claiming those championships in 1998 and 1999. Earnhardt hasn’t had the best luck in 2017 thus far; ranking 24th in the points with his best finish in eight starts this season coming at Texas Motor Speedway with a fifth-place finish. At 3PM EST a press conference held live on FS1 where Earnhardt officially confirmed his retirement from MENCS competition after the 2017 season in his own words. Look for Earnhardt to still be around the racing circuit even after this season. Earnhardt still has ownership in Jr. Motorsports which runs full-time in the XFINITY Series, and Earnhardt said himself he still is going to work. The big question looming after Jr’s retirement has been announced is who will get the No. 88 ride with Hendrick Motorsports? While there has already been much speculation, and nothing has yet to be announced, let’s look at the drivers who would land the top ride. Alex Bowman: Bowman is the obvious top choice after having filled in in the No. 88 car while Jr. was sidelined with a concussion. Bowman won his first career MENCS pole at Phoenix International Raceway in the 2016 Fall race, and it would prove to be the best race of his career so far. Bowman led the most laps with 197. Bowman tried to make what would be a last lap pass on the No. 20 of Matt Kenseth with 6 laps to go, but while passing Kenseth, Bowman got tapped by the No. 18 of Kyle Busch, which caused Kenseth to spin out. Bowman would finish the race in the 6th position. Bowman also previously had success at Loudon in the New Hampshire 301 in July. Before blowing a tire on lap 272, Bowman had been running as high as the 8th position. Ultimately, he would finish in the 26th position after the tire issue. Remember, Bowman previously ran very well for the team that Earnhardt owns in the XFINITY Series, JR Motorsports. In 2016, Bowman won the pole at Michigan, and would finish in the top-ten in all but two races. The only reason Bowman didn’t remain at JRM was because of the struggle to finish sponsorship. Kyle Larson: While Larson’s name has already been thrown around social media a lot since Earnhardt’s retirement was announced I don’t see him going to the HMS camp. Why? Well, with all the success Larson has already had this season in his No. 42 for Chip Ganassi Racing, I can’t see Ganassi letting this young talent go anywhere else. Larson has become the man to finish second a lot this season. The driver of the No. 42 finished second at both Las Vegas and Phoenix, which allowed him to take the points lead for the first time in his career. Larson than went on to pick up his second career pole, and second career win in the Auto Club 400 at his home track in California. While he finished 17th at Martinsville, he would keep the points lead, and go on to finish 2nd yet again in the O’Reilly Auto Parts 500. Larson has been a breath of fresh air this season along with his teammate Jamie McMurray. Both teams are running the best they’ve run in years so I honestly don’t see either driver going anywhere anytime soon. After-all, the finishes are there and they’ve been able to retain good sponsorship. William Byron: Byron’s talent shined bright right out of the gate with Kyle Busch Motorsports in the NASCAR Camping World Truck Series in 2016. Bryon finished the season 5th in the points, winning seven times to go along with eleven top 5’s, 16 top 10’s in 23 races. Bryon and his No. 9 team also clinched the owner’s Championship and Byron was named Rookie of the Year. Impressive? Totally. Talented? Of course! In my opinion there was no one better in the NCWTS last season. However, one thing needs to be remembered, Bryon is still only 19 years old. It’s plain to see Byron will race for HMS in the Monster Energy Cup Series in the future, but he isn’t ready for the big leagues, at least not yet. Byron just signed a multi-year contract last August with Hendrick Motorsports to run the XFINITY Series full-time in the No. 9 Chevrolet Camaro for Jr. Motorsports. Give this kid a few seasons to prove himself in XFINITY, capture some wins, maybe a championship or two and it will be only a matter of time before he’s racing for HMS in the Cup Series. Carl Edwards: While this is a long shot, I’m not surprised his name has come up. In January Edwards announced he would step away from racing to pursue other opportunities, and while Edwards never used the word retirement he has said any rumors of him returning to racing are not true. Many fans of the sport, including myself would love to see Edwards return to racing at some point, but I’m not sure it will happen. Edwards seemed happy with the decision he made, but I guess only time will tell. Brian Vickers: Vicker’s name has flown around Twitter in some tweets and polls that people have run throughout Tuesday. However, Vickers hasn’t raced full-time since the 2014 season when he raced the No. 55 for Michael Waltrip Racing. Vicker’s career has been marred by medical issues including blood clots and heart problems and while Vicker’s filled in for an injured Tony Stewart in 2016, he hasn’t raced in the MENCS since finishing 7th in the STP 500 at Martinsville Speedway that fall. The chances of seeing Vicker’s making a return to Hendrick Motorsports which he raced for in the MENCS from 2004 to 2006 is quite slim. Vicker’s stated he has had opportunities to return to the Cup Series, but wouldn’t race for just anyone. If Vicker’s races he wants to race for a team that can contend for wins which is understandable. While HMS has that equipment I just don’t think a return is plausible at this point. Greg Biffle: Biffle announced on February 17, 2017 that instead of racing full-time in 2017, he would join NBC Sports’ NASCAR America as an analyst in March. With that being announced earlier this year I feel it’s doubtful we see Biffle in the 88 even if it’s for next season. While I wouldn’t rule it out there just hasn’t been much talk about him racing again since Biffle and Roush Fenway Racing mutually parted ways following the 2016 season where Biffle finished 23rd in the points. Also; let’s remember Biffle is 47 years old, he’s not exactly a young gun anymore, but I wouldn’t rule out a return at some point if he can find a decent team with equipment that can run up front. Other names that have been mentioned for the 88 seat include Landon Cassill and Regan Smith; both have previous connections with Hendrick Motorsports. Cassill was a development driver for HMS in 2008. Cassill went on to drive in several races for Jr. Motorsports in the No. 5 National Guard Chevrolet. Regan Smith raced for Jr. Motorsports for the 2015 season so he as well has had HMS alliances. Whoever ends up driving the No. 88 for Hendrick Motorsports in 2018, we will have to wait some time for an announcement. There is certainly talent out there waiting for a good ride in the top series, so my guess is as good as anyone else’s at this point, but I would expect the driver who is signed to already have experience racing in the MENCS.